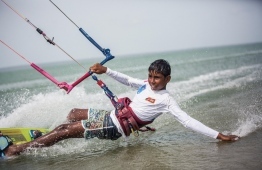 Rising star widely hailed as one of the youngest kitesurfers in Maldives, Hassan Mahir (Hante), was awarded the brand ambassadorship by the Maldivian branch of renowned kiteboarding company 'Slingshot' on Saturday. 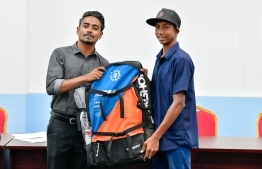 As per the 1-year contract signed at the Ministry of Youth, Sports, and Community Development, Slingshot will provide kiteboarding equipment and secure training opportunities to further enhance Hassan's skills. The 16-year-old expressed his gratitude and happiness upon receiving such support from a major international company. "This is one of the happiest days of my life", said the young athlete. 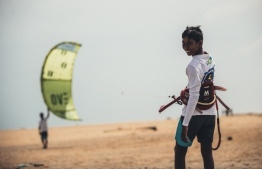 Slingshot Maldives' owner, Asim Mohamed (Simbe), iterated that this marks the first instance where a kiteboarder, especially a young athlete such as Hassan, was provided with an international sponsor. Asim further affirmed his belief that Hassan will fully utilise the opportunity. "During one of his interviews, Hante stated that he finds it most difficult to secure equipment. Under the agreement, we will supply his kit as well as training opportunities", said Asim, who heads programmes to develop kitesurfing across Maldives, in partnership with local kitesurfing organization 'Raalhugudi'. In exchange for his sponsorship, Hassan is expected to teach and guide those interested in venturing into the sport of kiteboarding. As such, due to a lot of interested youths in his home town of Goidhoo, Baa Atoll, Asim asserts that Hassan will be up for the task. 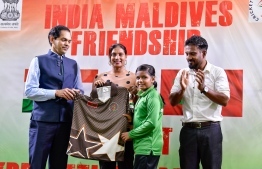 Deputy Minister of Sports Mohamed Azmeel, who handed over the sponsored kit to young Hassan, stated that water sports is a key component in the current administration's inclusive policies formulated around the sports industry, and that the government will actively source and provide assistance to talented individuals. "We believe that Hante is a world-class kitesurfer. The government will extend all of its support", said Azmeel. 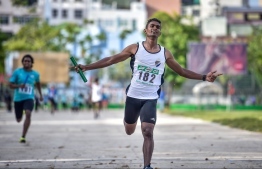 Having only started kitesurfing three years ago, Hassan, who is already recognized as a top athlete in his field, revealed that his goal is to compete in the upcoming Indian Ocean Island Games (IOIG) held in Mauritius, in June. 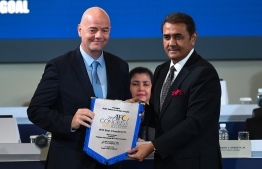 Maldives Olympics Committee's Secretary General Ahmed Marzooq stated that an opportunity such as this is golden at a time when the sport is in a state of expansion. Two-time world kitesurfing champion, Youri Zoon, claimed that Maldivian athletes, with access to training and dedication, can compete in regional and international competitions. 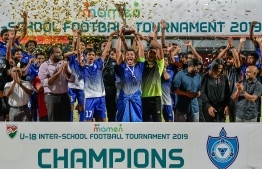 Hassan found the limelight when a video started circulating on social media, depicting the young boy, towed behind a bicycle, surfing on the flooded streets of Goidhoo.